America’s history of racial inequality continues to haunt us. The genocide of Native people, 250-year enslavement of black people, adoption of “racial integrity laws” that demonized ethnic immigrants and people of color, and enforcement of policies and practices designed to perpetuate white supremacy are all part of our difficult past. This country has witnessed great triumph, innovation, and progress, but we are burdened by a painful history that we have yet to adequately acknowledge. In the 1950s and 1960s, heroic civil rights activists staged a valiant revolt against racial inequality that compelled our nation to change some of its most racially offensive practices and policies. The Civil Rights Movement profoundly changed the character of American society and opened doors for people of color that had too long been barred by bigotry and ignorance. There has been substantial progress on a range of issues as a result of increased participation by non-white people in the political process. Diversity has become a demand that has strengthened the political, social, cultural, and economic landscape in significant and visible ways. But the Civil Rights Movement also triggered mass opposition. 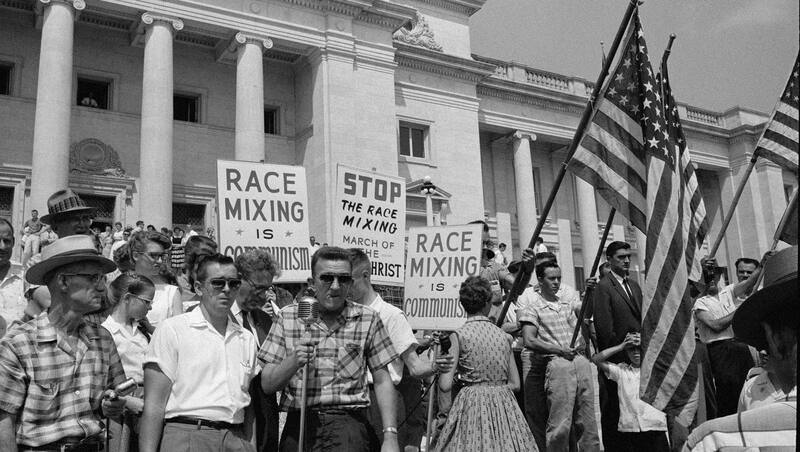 In response to demands for equal rights, millions of white Americans made clear their determined, unwavering, and committed opposition to racial equality, integration, and civil rights. This entrenched commitment to white supremacy inspired an often violent rejection of racial justice that is frequently overlooked. Understanding the opposition to racial equality is the focus of this report because it is central to confronting the continuing challenges of racial inequality today. The United States is still compromised by widespread racial bias and bigotry. We are still infected with false narratives of racial difference that marginalize and create hatred, prejudice, and discrimination against many people of color. Black and brown people are burdened with a presumption of guilt and dangerousness that is evident in myriad ways. Over the last 50 years, our political, social, and cultural institutions accommodated and embraced elected officials, journalists, and white leaders who espoused virulently racist ideologies. White segregationists were not banished or shamed; they were respected and elected to some of the highest levels of national authority long after the passage of the Civil Rights Act of 1964 and the Voting Rights Act of 1965. The accommodation of people who proudly proclaimed racist ideology and white supremacy implicates these institutions and undermines the notion that racial equality has been achieved. EJI believes that our forward progress, our future promise of a healthier and more just society cannot be achieved until we confront our history of racial inequality. We believe our nation is in desperate need of truth and reconciliation — and we are persuaded that process is sequential. We must first tell the truth about our past before we can overcome it. This is the third report in a series on America’s history of racial injustice. In 2013, we issued Slavery in America, which focused on the domestic slave trade and its legacy. That research and work inspired us to build the Legacy Museum: From Enslavement to Mass Incarceration, in Montgomery, Alabama. In 2015, we published Lynching in America: Confronting the Legacy of Racial Terror, which inspired another new cultural space in Montgomery, the National Memorial for Peace and Justice. We hope you’ll visit these spaces to learn more about the history of racial inequality in America. Segregation in America is a critical piece of the narrative of American history. It details an especially dynamic time when the character of America and our difficult history of racial injustice was on painful display. It was also a time of great hope for many people in this country who believed we could overcome that history and create a truly just society. That hope has inspired us to re-examine this era so that we might better understand the challenges facing us all as the struggle for racial equality in America continues.